Please leave a comment on this blog post with your answer, and let me explain a bit what I had in mind myself. We would first of all need an achievable goal. I would propose to build a microsite, something not too big, but still a complete site. I have available a responsive HTML5 design with parallax scrolling, it is based on Cool Kitten, made by Jalxob. I placed all the files for this design in a downloadable file: microsite.zip. To get started you will need to upload the design into your CMS, for that you can follow steps 1 and 2 of the Quick Guide to creating a Page Template. But rather than just following the quick guide, I think it makes sense to do a few things differently, and add some explanation on what you actually did in those steps. From there on it will get more complicated, we will need to divide the design into a Page Template and several Component Templates and write some actual C# Template Building Blocks to make the whole thing work for us the way we want it. Next we will also need to do some Schema design, and all of that needs to be described and explained, in a For Dummies style. Obviously that is not all simply going to fit in a single blog post, so if there is enthusiasm for such a series, I might be persuaded into writing at least some of the chapters of this series. My proposal is simple, first comment on this blog post letting me know if you need such a guide, additionally you can comment letting me know you want to help writing it. If it turns out that this is no longer required (since the getting started guides in the documentation already provide you with enough information to really get started), then I can always just simply release the finished microsite as a set of Schemas and Templates. 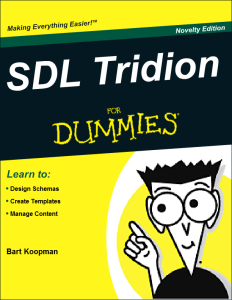 That will for me be a lot less work than writing a complete For Dummies guide, but for a starter in SDL Tridion it might be too complex to comprehend. So let me know, what is it that you (the community) require and would like? This entry was posted in Community, Development and templating, Helpful Tridion tips and tagged 2013, documentation, dummies, getting started, sdl, tridion by Bart. Bookmark the permalink. Interesting–would this be created through the For Dummies brand akin to the SDL Global Translation pamphlet? We’ve long since needed this type of material, count me in. We have some sites that aggregate lots of topics, but few step-by-step guides. And nothing recent that takes in the big picture of other SDL products, ECL, the Context Engine, etc. One practical question though–do you think such a guide compete with SDL’s Education offerings? Maybe I can start a separate post on how Education itself may need to evolve. @Alvin, I wasn’t thinking about an actual book, more a series of blog posts with “For Dummies” in the title. Also my initial goal would be to provide the missing info on the already existing Quick Guides from the documentation, but maybe I’m just wanting to explain too much. It would be great to have a Quick Guide for this with different tips for administrators such as myself who only have to make certain amendments on a website, such as removing some information and adding others. Whenever I go to make amendments at the moment, it is not clear what result that has on information linked to it. Would be good to have some Top Tips and shortcuts. @Ros, that is a difficult topic, since you already have an existing implementation, changes to that need to be made according to the implementation. If I were to explain you how to make changes to my example implementation, that might not necessarily have any relation to your actual situation. For those kind of tips, you need to speak to the developers/implementors of your website and Templates I’m afraid. @Ros, yeah it’s definitely hard to give specific advice for a given customer without knowing the full setup. But we can offer suggestions to improve an authoring experience. Basically whoever maintains Tridion for you could update the descriptions to describe what fields do or even offer pop-up instructions in the definitions (schemas) for your content. This may or may not take code, but it does involve IT to change the system. As a more built out example, some customers create online guides like Yale (http://web.yale.edu/help/guide/index.aspx). Any wiki, training system, or even Tridion managed site could help your organization make examples of what your fields do. If Experience Manager is on the project plan, that’d be the most in-context “explanation” you could have. @Bart, count me in. I’m struggling with making the distinction between schemas and presentation concrete in content modeling sessions and have some simple examples I’d like to help illustrate. Preference for how to “join in” and collaborate? I am getting the following error, when I try to run the Template builder. gone through the docs again, but not sure about what is missing to correct the error? @Rajesh questions on SDL Tridion implementations you can ask on http://tridion.stackexchange.com please be sure to take the 2-minute tour so you understand how you can ask your question and what it should look like. Actually, I wanted to bring to your notice about the missing information in the documentation,so if we can improve on it will help other users. FieldStartMarker looks like a custom function and there is no mention about it in the documentation and is also not available along with the download zip file.